Immigration skeptics need to get their stories straight, according to a misleading internet meme that has been going around the past couple of years. Immigrants either compete with natives for jobs, or they go on welfare. It can't be both, right? That's the point of the graphic below, which is a play on the famous Schrodinger's Cat paradox. "Too lazy to work" is presumably a reference to concerns about immigrants using welfare, which other iterations have made explicit. This study implies that two competing narratives about immigration are both true. Immigrants do indeed have a strong attachment to the labor force, as immigration advocates often point out. At the same time, however, immigrants consume a large amount of welfare spending, just as critics claim. The reason that both narratives are true is that the American welfare system has become increasingly focused on buttressing low-wage workers rather than supporting non-workers. Put more simply, welfare and low-wage work go together. Just as natives with low levels of education and large numbers of children are apt to consume welfare, immigrants with those same characteristics are also likely to be on welfare. A strong work ethic does not change this reality. To repeat, immigrant-headed households consume more welfare than native households not because they don't work, but because they have fewer skills on average and, as a consequence, have lower earnings. 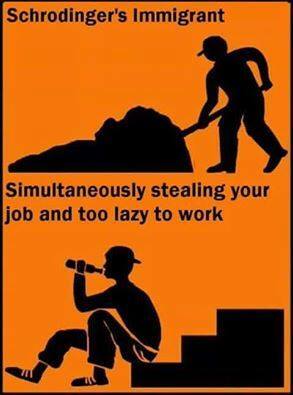 As long as we pursue a policy that encourages low-skill immigration, many more "Schrodinger Immigrants" will come across our borders.